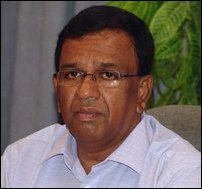 The Government of Sri Lanka should not block UN Chief of Staff Vijay Nambiar visiting the safety zone and acquainting himself of the conditions of the civilians, said LTTE political head, B. Nadesan when contacted by TamilNet on Saturday after reports of Sri Lanka rejecting UN appeal for ceasefire. "The GoSL is not making arrangements for his visit, to prevent him from knowing the nature and magnitude of its offensive and to prevent first hand verifications of the truth reaching the UN," he said. Mr. Nadesan said that he had already expressed his willingness during recent deliberations to receive the UN Chief of Staff in Vanni, but the GoSL sabotaged it. "If the UN, the apex body of humanity, is prevented from reaching the civilians suffering the worst conflict-related tragedy of this century who else can help the civilians," asked Nadesan. Meanwhile, Gotabaya Rajapaksa, the defence secretary of Sri Lanka told BBC Saturday: "I told him (Mr Nambiar) that we cannot extend our decision to restrict offensive military operations because there was no result during the previous halt in the fighting." The LTTE in a statement issued on Monday described the Sri Lankan announcement of two-days so-called 'halt of offensive' operations as an eyewash attempt to hoodwink the International Community while SLA continued its attacks on civilian population in Vanni. The LTTE statement also stated that the Tigers were calling for a politically and militarily meaningful ceasefire with humanitarian considerations. A such ceasefire would be meaningful and constructive with the facilitation of the International Community, the Tiger statement said.